There are people who see cookbooks as instructional guides, manuals to making a descent meal. And there are those of us who love to read cookbooks. As a teenager I discovered Joy of Cooking on my mom's crammed cookbook shelf, started to thumb through the pages and was hooked. I'd tuck it into my book bag to read like a novel when I should have been studying and later, in college, when I felt lost or homesick, I turned to cookbooks for they both sooth and entertain. Beneath a cookbook's lists of instructions and steps to follow lie tales as rich and deep as any to be found in fiction. They are forays into families' homes and glimpses into far off lands redolent with garlic and rosemary, saffron and cardamom. Recipes are stories with happy endings, of being sated and cared for in a way that feels gentle. I'll even suggest that the intentions of a cookbook author are the same as those of a novelist, to use both creativity and format to transmit an experience to the reader. Last night Deborah Madison spoke at a gathering for the University of Minnesota's Library Foundation and celebrated the Kirschner Collection of cookbooks. She told of how cookbooks guided and informed her on a lifelong journey as chef, cooking teacher, gardener and writer. Drawing deeply from the volumes written before her, Deborah saw how to lift up vegetarian cooking to satisfy even the most stubborn omnivore. Through cookbooks, she realized she could make meatless meals taste good, by recreating a classic meat ragout into one with meaty-tasting mushrooms. The illustrations and photos in classic cookbooks helped her create gorgeous meals of beautiful plates for her ground-breaking restaurant in San Francisco, Greens. Later, she relied on cooking and gardening books to transition into the different phases of her very successful career. Through reading and using cookbooks, Deborah found her voice -- warm and inviting, confident, inspiring. 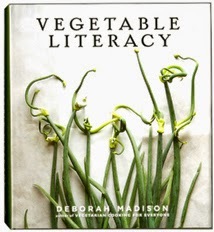 Deborah's books invited you into the kitchen, into the garden, as you stand at her side learning to make a lovely stir-fry or hearty soup, while you hear stories of her remarkable life. © Beth Dooley. Powered by Blogger.